Those of you who have made my Shell Stitch Bag will recognize this pattern. It is a variation of that pattern all gussied up for Valentine's giving. 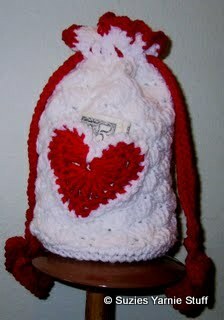 A small exterior pocket and hearts on the ends of the drawstrings, make this a cutie for the little girl in your life. Fasten off, weave ends into back of work. OUTSIDE BASE:Round 1-4: Rep rounds 1 - 4 of inside base but DO NOT fasten off. Ch1. Rounds 9-20: Repeat rounds 7 and 8. Round 21 (eyelet round): Ch 3, [ch 1, skip 1 st, dc in next st, ch 1, skip 1 st, dc in next st, ch 1, skip 1 st, tc in next st] repeat around, ending with slipstitch in third chain of ch 3. Round 23: Attach red with a sc in the center st of any 5 dc shell. *Sc in next st, (insert hook in next st, yo and pull through) repeat twice, yo and pull through all 4 loops on hook. Sc in next st, 3 sc in next st (center dc of shell). Repeat from * around. Chain 4, work all stitches in the first chain. 3 tr, 3 dc, chain 1, 1 tr, chain 1, 3 dc, 3 tr, chain 2, slip stitch. Ch 90, work all stitches in the fourth chain from hook. 3 tr, 3 dc, chain 1, 1 tr, chain 1, 3 dc, 3 tr, chain 2, slip stitch. Now slipstitch in each ch to other heart. Fasten off and weave in ends. Weave drawstrings in and out of eyelet round starting on opposite sides. Tie the ends of drawstrings in an overhand knot about an inch from the hearts. Round 1: Chain 4, work all stitches in the first chain. 3 trc, 3 dc, chain 1, 1 trc, chain 1, 3 dc, 3 trc, chain 2 slip stitch. Round 2: Chain 3, in first trc make sc and hdc, in next stitch 3 hdc, in next stitch 2 hdc, 1 sc in next four stitches, chain1 dc in trc chain 1, sc in next four stitches, 2 hdc in next stitch, 3 hdc in next stitch, hdc and sc in next stitch, chain 3 and slip stitch in joining. Fasten off. Round 3: Attach white with slipstitch in dip of heart. Ch 2, slipstitch in next st. Repeat around. Fasten off. Weave in ends and sew heart about an inch above round 5. Leave the top of heart open for a pocket. Chain 24 and make heart (pattern below) in the 4th ch from hook, repeat for the length you want. End by chaining 20 and fastening off. Make all stitches in the designated chain. 3 tc, 3 dc, chain 1, 1 tc, chain 1, 3 dc, 3 tc, chain 2, slip stitch. Fasten off. 1. Any size yarn and appropriate hook can be used. With size 10 thread it makes a delicate garland, worsted weight makes a more “county” look. 2. 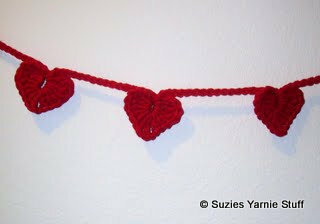 When you re crocheting the second half of the heart you will be crocheting over the chain as well. 11/14/09 Pattern edited to add * in front of the first yarn over of cluster stitch. GAUGE: Unimportant, but bag should be worked loosely. 3. I blocked my bag on a book that is 8.5 wide by 1.25 thick. 4. After pulling bag into shape and getting it on the book, I place a second book on top of the flap to get it nice and flat. ROUND 2-28: Ch 2 (this counts as turning ch and not the first stitch), hdc in each st around. Join with a slipstitch in top of first hdc. [88 hdc] Fasten off. Special stitch: Cluster = *Yarn over (yo), insert hook in next stitch, yarn over, draw yarn through the stitch, yo, draw through 2 loops on hook. Repeat from * 2 times.. Fold bag flat and mark upper right hand corner. Join yarn with a slip stitch in marked stitch. Change colors as desired. The bag in photo yarn was changed every row. This pattern is for a close fitting beanie. It is done in single crochets to take full advantage of the stripes. SWS has only 110 yards per ball and the challenge was to make a beanie that covers the ears yet only takes one ball. I achieved this by incorporating eyelets into the beanie. Read the notes at the bottom of the pattern before beginning. This pattern is written for Paton’s SWS (Soy Wool Stripes) but any worsted weight yarn should be okay. I have crocheted it using Red Heart Super Saver with good results. 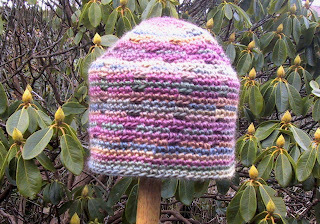 This pattern is for a close fitting beanie. It may seem tight at first but crocheted items stretch after wearing a short while and will loosen up. If your gauge is off you may not have enough yarn to complete 32 rounds, but 31 rounds seems to be a serviceable length. I had one skein of SWS that had 6 knots in it and there was only enough yarn for 31 rows. 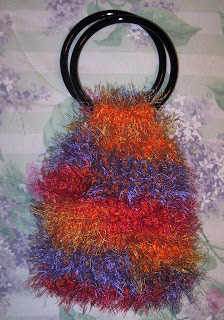 This cute little bag can go with you to dinner, church or dancing. It can be lined or left unlined. If you decide to skip the lining you will need to put your stuff in a small zippered bag, like a cosmetic bag. But lining it will only take a few minutes and the simplest sewing, and you’ll be ready to go. 2. I used Dritz #072879 098242, 5 inch plastic handles that I bought at Michaels. (I love those coupons.) I have some smaller handles (about 4 inches) off a purse I bought at Dollar Tree I’m going to try those as well. $1.00 what a great price wish I’d have bought them all. 3. To fluff the Fun Fur I use a small hair brush and gently brush the right side of the item. 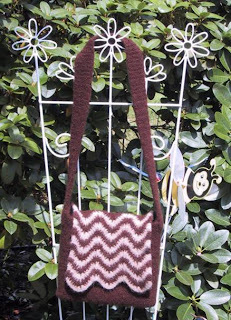 Bag is worked entirely with two strands, one of worsted weight and one of Fun Fur held as one. Ch 8, leave a 9 inch tail for finishing. Fasten off leaving a 9 inch tail for finishing. Fold bag in half matching the beginning and ending rows. Match the sides and sew rows 6-19 to each other on both sides of bag. If using the optional lining make that and insert now. Fold top over one handle and sew top of row 1 to body of bag. Repeat on opposite side. Using newspaper draw around bag, rows 6-19 for a pattern. Add ½ seam allowance on all sides (approximately 9 X 15 inches). Cut one, by placing 9 inch edge on the center fold of lining fabric. This will make a lining piece that is approximately 9 X 30. You will now create a pouch to insert in your bag. This method will create a pouch with no raw edges on the inside. Fold the 30 inch strip in half right sides together on center crease. Fold the 9 inch wide raw edges to center crease, wrong sides together. You now have a piece that is four thicknesses thick, with the 9 inch raw edges even with the center crease. Using a 1/4 inch seam allowance stitch both sides, from the folded edge toward the center crease. Stitch the center crease edge ¼ inch from fold. If desired stitch around upper edge ¼ inch from edge. Center a 1.5 inch strip of Fusion Velcro ¼-1/2 inch below top edge of pouch. Fuse in place per product instructions. Or sew a snap to the top edge of lining. Place pouch inside crocheted bag and sew to top of rows 6 and 19.